IF that much-abused word “propaganda” is traced to its origin it may possibly be taken to indicate “matter” (in the words of our classics master) “meet to be spread abroad.” With this interpretation much of the press matter relating to bellringers and their work during 1969 may be designated true propaganda, for among it we find no small amount of work clearly directed towards educating the public. This committee feels that there is a growing need for the spread of reliable information about ringers and their part in church life and worship, not only as a means of recruiting for belfries but also as a counterblast to the view, held in some quarters, that the bells of churches are declining in importance. It is with pleasure, therefore, that we welcome the enterprise of The Western Times and Gazette, which embarked on a series of features showing the work of a number of ringing bands. We have received cuttings relating to Bridestowe, Drewsteignton, Honiton, Dawlish, Ottery St. Mary, Braunton, North Tawton and Bridgerule; and perhaps there are more. Each feature presents a photograph of the band of ringers and a short but informative paragraph of the ringing activities. The Isleworth parish magazine carried an arresting centre-page spread setting forth the duties, privileges and pleasures of the bellringer; a similar invitation to join in this branch of church work appeared in The Herefordshire Times, where Sally Hesmondhalgh provided a readable article accompanied by a very jolly photograph of the cathedral band. The Howdenshire Gazette reported on the recording of Howden Minster bells for an instructional disc - another of the enterprises of the indefatigable Mr. Norman Chaddock. Bellringers have always done a great deal of work in maintenance and repair in their towers, and in recent years there has been an increase in this kind of work and a larger enterprise in assisting parishes by cutting expenses. We still have fresh in mind the formidable tasks undertaken and carried through so successfully by the sturdy workers at St. Leonard’s, Shoreditch, and evidence of other devoted labours is not lacking. We note the valuable assistance given by the ringers at Whatton during the rehanging of the bells and are glad to see that this attracted the attention of The Newark Advertiser. Similar important work was undertaken by the bellringers at Ruddington; The Nottinghamshire Guardian gave publicity to the recasting of the bells and to the local voluntary work that helped to make it possible to proceed with the project. At Stinchcombe, Gloucestershire, the parochial church council petitioned to be allowed to rehang the six bells “dead” and install an electric chiming device. Objections to this led to the holding of a consistory court at Gloucester and the proceedings aroused considerable interest in the national press. In support of the plan it was argued, among other things, that it was virtually impossible to get ringers; but Mr. Frederick Sharpe, speaking for the objectors, expressed the opinion that ringers could always be obtained if enough trouble was taken, It would seem to us that the transactions of the men of Ruddington and Whatton (quoted above), and the efforts of many other parishes, might well be studied by Stinchcombe before any decisive steps are taken; and something of this kind seems to have been in the mind of the chancellor when he adjourned the case. In August The Church Times gave us an interesting column by Rosamund Essex, dealing chiefly with the passing bell and the decline of this custom. The article then proceeded to say: “but now bells are out - bells for any occasion except weddings. The sound of bells, once the pride of England, seems distasteful to this generation.” This seemed so important a misstatement that the convener of this committee wrote to The Church Times in an attempt to correct any misunderstanding and to make it clear that hundreds of churches throughout the land were sounding their bells regularly. The editor did not see fit to print the letter, nor has anyone from clergy or laity provided any confutation of a statement that might, in an important and influential journal like The Church Times, create a false impression in certain minds. West Country papers gave great prominence to the underpinning of the tower of All Saints’ Church, Westbury, Wilts. The resumption of ringing was marked by photographs of the band and of our old friend Mr. John Fidler testing the bell frame. At Solihull the addition of two trebles to make a ring of 12 was well featured in Midland papers, and the convener was commissioned to write an article for The Solihull News. There was considerable local interest in the handbell peal rung on the summit of Helvellyn, and The Westmorland Gazette favoured us with a full account of the exploit and pictures of the aspiring trio of performers. The visit of the Central Council to St. Albans and the honouring of Mr. Walter Ayre received full publicity, and The Herts Advertiser made the most of the sensational (if unfortunate) fall of the 11th at the Abbey. We commend unreservedly the excellent essay on the Council and its work, written for Hertfordshire Countryside by Mary Coburn. In the Irish Press the Wexford Festival and the attendant bellringing produced a short account of our art in The Irish Independent, and The Evening Herald described the bells of St. Audeon’s, Dublin, and the rather novel method of ringing them in the bell chamber itself. Of the feature articles that have reached us some are of the conventional type, and one or two are worthy of special note. Among these is an essay on the welding of cracked bells, written by Mr. K. J. Clews and published in Maintenance and Equipment News. Mr. Clews writes in such a way as to command respect in this interesting and oft-debated question. In Quest, Mr. J. C. Baldwin writes on his hobby of bell-ringing - another good piece of propaganda. Away in Grahamstown Miss Sarah Troughton’s talk on ringing given to the Women’s Association of Holy Trinity Church was accorded a lengthy summary in The Eastern Province Herald. With these we must mention an essay on Stresses in the Belfry (Civil Engineering and Public Work Review), Canon Thurlow’s persuasive article “Bells” in the Glendalough and Kildare Diocesan Magazine for October, and a lively contribution to The Weekly News by “Joanna,” who tried her hand at ringing at St. John’s Episcopal Church, Alloa. Two 600-year-old bells at Christchurch Priory, Hampshire, were fully described in Bournemouth Evening Echo and a great deal of trouble was taken in securing the close-up pictures. An interesting echo of the past sounded in the August Rhyl parish magazine, where some account of the very notable Lewis Jones recalled this gentleman’s contacts with Rev. H. Law James. The Rhyl Journal followed up the theme by an account of the ringers at St. Thomas’, Rhyl. Kingsmead Booksellers, Bath, have shown courage and enterprise in putting out three reprints: “Bells and Bellfounding 1879” (facsimile edition), Tom Ingram’s “Bells in England” and Walters’ “Church Bells of Wiltshire.” The anonymous review of the latter in The Wiltshire Times and Gazette was a thorough and thoughtful piece of work. Among other publications are “The Little Book of Bells,” Eric Hatch, and “Casting a Bell for Exeter Cathedral,” Rev. J. G. M. Scott. A broad survey of the year’s literature shows enterprise and industry. For ringers there has been much to read and study, and some useful work has been done in keeping the chief objects of our work as officers of the Church before the public. Before the commencement of the business of the 73rd Annual Meeting of the Central Council of Church Bell Ringers on Tuesday, May 26, at the Kings Hall, Ilkley, Yorks, the president of the Council, Mr. John Freeman, at the request of Mr. Wilfrid Wilson (convener of the R.W. Committee), presented Mr. Tom White, who has retired after 23 years as editor of the R.W., with a silver dish, suitably inscribed on the lid and containing a cheque for £600. Mrs. White received a porcelain figure of a girl in costume. Mr. White, who was greatly moved by the generous gifts made to himself and Mrs. White, suitably acknowledged the presentation, and as they left the platform both received tumultuous applause. The civic welcome extended to the president (Mr. John Freeman), officers and members of the Central Council took place at H.Q. on Monday evening. The chairman of Ilkley U.D.C. (Councillor R. P. Bushell), who was accompanied by his wife, was introduced by Mr. Freeman and amidst applause said Ilkley was indeed delighted that the Central Council had chosen their town for its meeting, and had also honoured a family who during its lifetime did so much to encourage the art of change ringing. He went on to enlarge upon the Snowdon family and the work that its various members had done for Ilkley and for the bell-ringing Exercise. The speaker said that over a long period church bells had played an important part in the life of the country, chiefly as a “call to worship,” and he expressed pleasure that so many young people were being encouraged to participate in change ringing. This was to be his last public function as chairman of the U.D.C., and when he handed over to his successor on Wednesday it would be a pleasant thought that his year of office terminated with the pealing of the bells by the members of the Central Council. He concluded by wishing success to what remained of the meeting and hoped one day the bellringers would return to Ilkley. The vicar of All Saints’ Parish Church then addressed the gathering and extended good wishes and appreciation for the work that bellringers carried out. He was proud to be vicar of the parish in which the Rev. John Snowdon and his sons, Jasper and William, had lived and worked. A Gilbertian situation followed whereby Mr. Vernon Bottomley, as president of the Yorkshire Association, extended his official welcome to the Council, of which he is the hon. general secretary! The banter which he used towards the president was quite amusing and there is no doubt Mr. Bottomley is a Yorkshireman “to his fingertips.” He completed his speech in local dialect, bidding the Council welcome to come again. The president, before closing the formal proceedings, amused the company with a fund of stories and anecdotes which enlivened the proceedings considerably, before thanking the Yorkshire Association and other individuals for their kindness and hospitality. Mr. Wilfrid F. Moreton, hon. gen. secretary of the Yorkshire Association, was particularly mentioned, for a considerable amount of the organisation had been his responsibility, and carried through with Mr. Moreton’s usual precision and thoroughness. Those responsible for the tours and trips were also thanked, as were the ringers who had prepared the towers and seen everything was in order there. “Please convey congratulations to the bellringers at Ilkley at the 70th year of the Council meeting at Ilkley this weekend, from Uncle Jasper Snowdon’s two remaining nieces: Olive Strickland (Dartford, Kent), Christabel Graham, in Edinburgh. “We remember also in gratitude the unstinted work of our cousin, the late Margaret Snowdon, of Cartmel, in keeping the bellringing books in circulation through difficult times between two world wars. This message was greeted with applause. The meeting held at the headquarters of the Central Council (the Craiglands Hotel) on the Sunday evening (an informal one) was so successful that it is proposed to make it an annual “get together” in order that C.C. members and other ringers attending can express views on the various aspects of the agenda and other relevant matters connected with the Exercise. The report of the Standing Committee on the constitution and procedural working of the Council, printed and circulated, was the subject of this year’s gathering, and the president (Mr. John Freeman) opened the meeting by introducing the “panel” on the platform who were supporting him. These were Messrs. E. A. Barnett (vice-president), R. F. B. Speed (Aims, Objects and Procedures report), P. A. Corby (Membership), D. Beresford (Finance) and V. Bottomley (hon. secretary). A number of suggestions came from the body of the hall and at times the light-hearted quips caused considerable merriment. Each section of the report was dealt with and at the end the chairman summarised the points of a section discussed, but no conclusions were drawn, although at the Council’s business meeting on the following Tuesday this summary was to be read, with the possibility of further proposals and general acceptance of at any rate some of the points made. The proceedings lasted for nearly two hours and it was agreed at the close that the Standing Committee were now working on the right lines. A show of hands on the question of whether the Council is too large found this not to be so (by a two to one majority), although there were many who abstained from voting. The business of the council was opened with prayer led by Canon A. G. G. Thurlow, and was followed by the hon. secretary giving details of representation: membership, 204, and, with one exception, all subscriptions paid. New members were then welcomed and honorary members elected. The gathering stood whilst those members who had died during the past year were remembered, and the minutes, printed and circulated, were read and accepted with one correction. The reports presented by the hon. secretary and hon. librarian were also approved, and the 1969 accounts were disposed of with little comment except for investment suggestions. Similar treatment was given to the report on the Carter ringing machine approved with a few inquiries by interested persons present, and answered by Mr. D. Hughes. Three hours were spent discussing, item by item, the report of the Standing Committee, and considerable time was also given to various motions on the agenda. The reports by committees (12 of them!) were presented and the majority accepted without comment, but a few occupied the Council’s time, some members thought, “unnecessarily long.” In one instance a proposal to pass on to the next business was immediately accepted. Coventry is the association that will entertain the Council in 1971, but no centre has yet been chosen as HQ. For 1972 a suggestion that the possibility of meeting in London be investigated was favourably received, and inquiries are to be started. A variety of small, but quite important, items arose under “any other business,” but as the hands of the clock had reached 6.20 little discussion followed. Thanks were given to many bodies and individuals before the president declared the meeting closed. Peals were attempted (and some were successful!) among the many ringing activities over the week-end, but the organised coach tour on the Monday was possibly the one enjoyed most by a section of the members. Leaving H.Q. at 9 a.m., a pleasant and comfortable trip of some 100 miles was made with ringing at Skipton (8, 22 cwt. ), Giggleswick (8, 10½ cwt. ), Middleham (8, 18 cwt. ), Ripon (10, 23 cwt.) and Harrogate (8, 12½ cwt.). Lunch was at the 16th century Rose and Crown at Bainbridge, and tea at Ripon. The beautiful Yorkshire countryside was at its springlike best, and Mr. Fred Munday was the organiser, with Mr. Ted Hudson giving considerable verbal assistance as courier, his knowledge of the houses, castles, churches - and pubs - over the route taken being advanced for the benefit of those on the coach. The entertainment side of the tour was supplied by the Truro contingent sitting in the rear of the coach, and it was regretted by some that they did not start their “entertaining” earlier in the day. Altogether, a happy and successful outing. FOUR years ago, after 75 years of the Council’s existence, this committee reported there had been a total of 862 elected members - up to the present time the total has risen to 929 elected members. Contained in three ledgers are sheets giving biographical details of 418 deceased members, and there are another dozen sheets in the process of being completed. Enquiries are still going on for information of some past members who are either known or presumed to have died. The committee are pleased to record that Mrs. J. Dodds, St. Albans, has very kindly undertaken the work of writing the biography sheets. Lt.-Col. Jerram was a former master of the Truro Guild and did much to stimulate interest in change-ringing, which he himself was able to practise at Plymouth and Devonport. He was a frequent contributor to the columns of The Ringing World. Mrs. 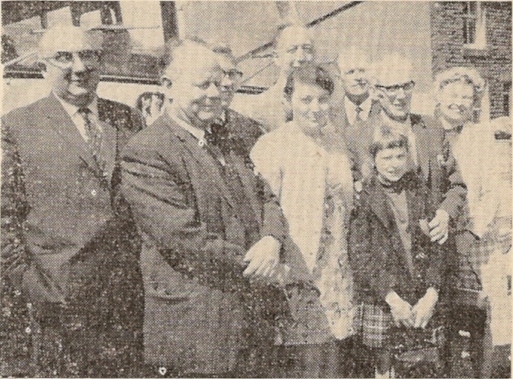 Hairs was the daughter of the late Frank Bennett, also a past member of Council. Before learning to ring tower bells she had rung many peals on handbells, including Stedman Cinques. She was the first lady to take part in a peal of Cambridge Surprise Maximus. Mrs. Hairs was a founder member of the Ladies’ Guild and held secretarial posts for both this Guild and for the Sussex County Association. She was one of the very few ladies elected to membership of the Ancient Society of College Youths. W. C. West had been captain of Melksham band for many years. He was a branch secretary of the Salisbury Guild from 1932 until 1947, when he was elected chairman. In 1950 he became general secretary and treasurer of the guild and in 1966 was elected guild president. G. L. Grover was active in the formation of the Guildford Guild in 1927. He was a district secretary before holding office as general secretary for a period of 20 years. Also for 20 years he was captain of the band at West Clandon. T. E. Sone was a member of the general committee of the Kent C.A. for over 30 years and did much influential work within the county. His first peal was Grandsire Triples and records show that he made a particular study of Holt’s Original composition by calling it no fewer than five times from each bell. OUR report for last year referred to changes and cost of improvements in the format of The Ringing World; this year has been one of even more change - of editor, of convener and of still further changes in appearance. 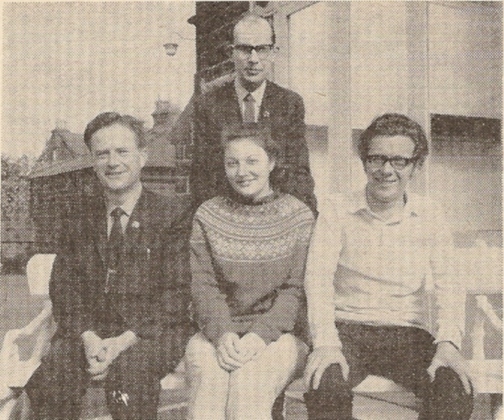 Following a brief meeting at St. Albans, the committee have met in August, 1969, at Rugby, in November, 1969, and March, 1970, in London. In spite of long distances, the five members of the committee, Mr. D. Hughes, our treasurer, and the two editors have recorded 100% attendances, and at each of our meetings a member of the dais has also been welcomed. On October 1, 1969, Mr. C. W. Denyer took up his appointment as editor, a very happy outcome of many years of search and weeks of negotiation. From that date until the end of the year the services of Mr. T. W. White were retained as a consultant, and the smoothness of the changeover is greatly due to this. Our new editor, with his long experience of the technical side of the work, has been able, with the committee’s agreement, to negotiate with Seven Corners Press Ltd., so that by the adoption of type and layouts which were more economical with the apparatus available we have been able to obtain the agreement of our printers for the maintenance of the existing (1969) charges for printing The Ringing World for a further 12 months at least. With rising costs and wages this is no mean achievement and we congratulate Mr. Denyer on the outcome. We introduced Mr. Denyer and his family to our readers in The Ringing World of August 22, 1969 (page 649). The progress made since he took over has been received so favourably by the large majority of the readers that our hopes for the future under his care are high. He has shown great readiness to make various small changes suggested by readers and, with our support, he will continue to do so wherever possible to meet valid criticism. In The Ringing World of September 19, 1969 (page 723), we paid a full tribute to Mr. White for his magnificent service to the Exercise for 23 years. And in the same issue, in the name of the Central Council and of the committee, we launched an appeal to the Exercise to show their appreciation. We are gratified to note that at the time of this report the response had been well up to our hopes. At the Council meeting this year the president will present to Mr. White a very tangible token of the esteem and affection in which he is held by ringers everywhere. We are grateful to Mrs. Staniforth who has received, acknowledged and banked the many contributions, and we thank all who have supported us. The accounts for 1969 will as usual be presented separately, but we are pleased to quote from our auditor’s report that they “reveal a profit for the year of £791, as compared with a loss for the previous year of £966. Taking into account the S.E.T. refund which was received in respect of previous accounting periods, it is apparent that your newspaper broke even during the second six months of the year.” We should draw attention particularly to the fact that during the last three months of 1969 additional expenditure was incurred for the salary of the new editor and the retaining fee paid to Mr. White as consultant. Further changes at Guildford include the taking over by Seven Corners Press Ltd. of the work previously done by the Surrey Advertiser. This meant that new arrangements had to be made for the distribution of newsagents’ copies, hitherto carried out for us by the Surrey Advertiser since the cessation of business of Rolls House. We are pleased to say that Mr. Lucas at Guildford has now undertaken this work also and we are no longer dependent on other firms, being our own distributor and publisher. With the advice and help of our auditor, Mr. David Tate, the system of accounting by Mr. Lucas has been revised during the year so that we are now able to keep a frequent check on the financial position throughout the year, without calling and paying for a full scale interim audit, as we did in 1969. To quote the auditor again, “the additional work Mr. Lucas has taken on has meant that it has not been necessary for us [the auditor] to ask for an increased fee for the preparation of the accounts, despite rising costs.” Our thanks are clearly due and have, of course, been given both to Mr. Lucas and to Mr. Tate. We are still unable to say whether any dividend will be received following the liquidation of Rolls House, referred to in our last annual report, but it will be recalled that the whole amount has already been written off. We have found it necessary, because of the need to preserve topicality, to rule that unless in the clear interest of the Exercise news items received in The Ringing World office later than one calendar month after the event shall not normally be published. This decision was announced to our readers on August 19, 1969. We have also found it necessary to warn our readers of our concern at the delay of certain contributors in submitting peals for publication. Peals six months old are not news and only add to the unwanted backlog of peals at certain times of the year. We have considered this matter further, and peals sent in which are three months old, or over, will be printed in abbreviated form, as used for quarter peals. One of the items we have dealt with was the question of charges for the new pictorial covers, and because of possible confusion between the report in The Ringing World of December 5, 1969 (page 947), and the correction printed on December 19 (page 989), we feel it desirable to reiterate here that when for a particular reason a guild or a band ask for the cover picture and accompanying articles for a specific date we considered it right both to charge for the block and to hope for payment for 50 copies of that issue. Our experiment with gift tokens last December was only partially successful - some of the subscriptions so obtained would have been received anyway. However, the form of application did not appear until December 12. We shall repeat the experiment next Christmas, giving longer notice. As we announced on December 5, we have decided on a new venture - a Ringing World Calendar for 1971, to be produced during this coming summer and containing for each month a full size picture selected from our covers. We hope to have samples on display at Ilkley and shall welcome comments from members of the Council. Any advance orders that can be given will help us to assess the likely demand. We ask for the support of the whole Exercise for this venture and can think of no more appropriate calendar for a ringer’s home or for the ringing chamber. Next year The Ringing World will celebrate its diamond jubilee - a wonderful feat for a journal such as ours and a tribute not only to the work of our predecessors and the successive editors but also to the keen interest and support of many devoted readers. Recalling the success of our golden jubilee number, we are considering ideas for a suitable celebration issue and will welcome any suggestions which our readers may care to submit either to the editor or our convener. The Index for 1969 has been prepared separately from the journal as another experiment. You will not have to extract the Index from the paper so that it can be bound or filed at the front or back of the volume. We have been able to use those pages for other matter and at the same time save the cost of printing separately. Once again we have to thank Mr. H. L. Roper for giving so much time and patience to the task of preparing the Index, and this year the anonymous typist who made it possible to produce the copies at negligible cost. We have decided that this coming August we shall retain pictorial covers and not as formerly issue 16 pp. papers without covers. Readers will have noticed that in recent issues there have appeared photographs attributed to The Ringing World itself. We have to thank our new editor, who deliberately chose as a parting gift from his former employers an appropriate camera, so that he could take such photographs when he attends meetings and social functions, thus giving us all pleasure and saving cost to The Ringing World. We are still greatly concerned at our circulation figures. The average weekly sales for the first two months of 1970 were 5,781, compared with an average for the first half of 1968 of 6,150, for the second half, after a price increase, of 6,012 and for the first quarter of 1969 of 5,907. We hope all readers will appreciate that continued improvement in our service to them depends on an increasing circulation. We must end this already long report with our thanks to all who have helped in any way to maintain and, we think, enhance the service we have been able to give to the Exercise, To those, mentioned earlier in this report; to Mr. David House, who has prepared the leading peal ringers’ list; to Mrs. Lucas, who continues to work valiantly in The Ringing World office; to the staff of Seven Corners Press for their cooperation in the production of what many of your letters call the New Look; to those friends who have provided a place for our meetings, and wonderful hospitality; and above all to all our loyal supporters, both for their written contributions to our pages, for their regular purchase of the paper and their generous voluntary contributions. The convener wishes specially to thank all those, whether committee members or not, who have helped him to get through very long agenda at our meetings, and Mr. White and Mr. Denver for their never-failing support in all he and the committee have tried to do. A summary of the meeting held at Ilkley, Yorkshire, of the second session of 27th Council was given in our last issue, and the more detailed report will be printed during the next few weeks. It is not intended to give full discussions, except where considered of more general importance. The elected members should report back to the Guilds and Associations they represent, but reference to The Ringing World of April 24 may be necessary in some cases to follow the topics discussed, particularly the interim report of the Standing Committee. Following the presentation to Mr. and Mrs. Tom White, reported elsewhere, the business was opened with prayer led by Canon A. G. G. Thurlow. Apologies were read out from F. E. Haynes, G. W. Fletcher, T. P. Edwards, R. G. Wilson, J. W. Cotton, Rev. R. Keeley, N. Golden, F. A. White, M. J. Fellows, N. Mallett, W. A. Osborn, J. F. Smallwood, H. J. Sanger, G. I. Lewis, E. F. Willcox, W. L. Weller, A. J. Brazier, J. E. G. Roast, D. F. Murfet, B. Jones and J. P. Fidler. The hon. secretary’s report, which had been circulated, gave the total membership as 204, with one vacancy, and three honorary vacancies. All subscriptions had been paid with one exception. New members were welcomed by the president and each stood as his name was called: H. C. Lonyon (Chester Guild), P. Reynolds (Lincoln Guild), J. Prytherch (St. David’s Guild), R. W. Pipe (St. Martin’s Guild). The election of honorary members followed and these were: Mr. G. R. Drew and Mrs. Shirley Drew, who deal with the C.C. publications (proposed by Mr. F. Sharpe, seconded by Mr. V. Bottomley); Mr. George Pipe (D. Beresford and E. Shepherd); C. W. Denyer, Editor The Ringing World (W. H. Viggers and D. A. R. May) and F. A. White (a retiring member re-elected). Mrs. R. F. B. Speed did not seek re-election as an honorary member. Six names were read out in the obituary list, viz. : W. C. West (Salisbury Guild), G. L. Grover (Guildford Guild), H. O. Baker (Chester Guild), T. E. Sone (Kent County), T. H. Francis (Cumberland Youths), W. Shepherd (Winchester and Portsmouth and Guildford Guild), and Canon Thurlow said a prayer for the departed. The minutes were approved with the alteration of one word, and there were no matters arising, following which the report of the hon. secretary was accepted without comment. Mr. Frederick Sharpe, the librarian, presented his report and made a strong appeal for books which had been on loan, in some cases for several years, to be returned. Mrs. Olive Barnett suggested that a list of names of “long-term” borrowers be published in The Ringing World, but Mr. R. S. Anderson advised caution in such matters. Mr. Bottomley next produced the accounts for 1969 and moved their adoption. Mr. Garner-Hayward seconded, and some discussion followed about possible reinvestment of moneys in the Clement Glenn Fund to the Central Board of Finance. Others taking part in this debate were Messrs. Bayles, Beresford, W. Wilson, Seager, J. Mayne and T. W. White, the last named giving details of comparative Ringing World costs when published by Rolls Publishing Company and today’s costs. The hon. secretary and treasurer took note of various suggestions made for future possible administration and investment. Mr. Douglas Hughes answered several questions on the use and the replacement of parts when necessary of the Carter ringing machine, and the report presented was agreed, a suggestion being made that it would be wise to consider reducing the number of demonstrations and so prevent undue wear and tear. Although this report had occupied a couple of hours at the informal meeting on the Sunday evening, at Tuesday’s gathering the Council spent a further three hours debating the report, item by item. This, however, could not be considered a waste of time. Several members found that, from the earlier discussions, they had been able to consider some items from a different standpoint and had changed their minds. Naturally this brought out a lot more for the meeting to hear, and in several cases the whole section was referred back to the sub-committee for further consideration and to report again next year. At the outset the president proposed the adoption of the report, which, was seconded by the vice-president (Mr. E. A. Barnett), but it was later agreed to alter the word “adopt” to “receive,” this being on the motion of Canon Felstead, seconded by Mr. R. S. Anderson. Mr. Ayre, supported by Mr. Shepherd, asked that more emphasis be put on the role of ringers as church workers and said their first job in this connection was ringing for church services. The sub-committee responsible for “Aims, Objects and Procedure,” for which Mr. R. F. B. Speed was spokesman, were, asked to note this suggestion. Many members took part in the discussion of this section, among them being Messrs. Beresford, Dodds, Lufkin, Rev. J. Scott, H. Rogers, Chaddock, Wilson, Sharpe, Cook and Croft. Points noted for the sub-committee were: Section 2 (6) the words “provision and maintenance” in place of “financial assistance,” and the Biographies Committee, although not mentioned, would remain an official committee of the Council. Items 3 (4), 3 (9) and 3 (11) were all suggested for possible amendment, and the Overseas Committee, which does very important work, should be encouraged to report its activities regularly. This was also suggested for the Education Committee 3 (7). Taken by The Ringing World at the formal welcome given to the Central Council: l. to r. the vicar of Ilkley (Rev. R. Cleland), the chairman of Ilkley U.D.C. (Cclr. R. P. Bushell), the president of the Central Council (Mr. John Freeman), the president of the Yorkshire Association (Mr. Vernon Bottomley) and the ladies, Mrs. Bushell and Mrs. Jeanne Bottomley. The increased amount of work and the larger number of inquiries made to the Towers and Belfries Committee were commented upon and an assurance given that this body was in operation the whole year. That the peals analysis was well worth while was the general opinion, and in winding up this section Mr. Speed said all the points made would be considered. Under Sections 4 and 5, members taking part were Messrs. Roper, Beresford, Mrs. Staniforth, Carlyle, Dodd, D. May, V. Bottomley, Crossthwaite, Lufkin, Mayne, Seager, Butler, Canon Thurlow, Rev. Scott, Cook, Speed and G. Pipe. Further consideration is to be given on suggestions made and these included the possibility of a national scheme to give financial assistance to churches (with bells) that require it; a national appeal for The Ringing World; more encouragement for associations to start and to augment restoration; the investment of money raised for restoration funds; training recruits for towers with no ringers; the purchase of bells from churches being demolished, particularly where such bells have historic value or connections; the movement of bells from redundant churches to churches on newly-populated estates and new towns; the possible approach by the Central Council to building societies for loans when restoration work is necessary and funds low. At the end of this section the meeting agreed that the sub-committee were proceeding on the right lines. As briefly reported last week, the presentation of a piece of Doulton china, a silver dish and a cheque for £600 to Mr. and Mrs. Tom White was made at the Central Council meeting at Ilkley. Mr. Wilfrid Wilson, convener of The Ringing World Committee, said it was the wish of ringers everywhere and of all present that day to give recognition of the 23 years’ loyal service to the ringing Exercise by Tom White as Editor of The Ringing World. He then requested the president of the Central Council (Mr. John Freeman) to make the presentation. Thanking Mr. Wilson for according him the honour of making the presentation, Mr. Freeman handed the china figure to Mrs. White and said it was not only in appreciation of her help to Tom, but with the respect and affection which was felt by all towards Mrs. White. Amidst applause, Mrs. White held aloft the figure for all to see and admire. “Recently in church we were singing the hymn, ‘Thy way, not mine, O Lord,’ in which a line runs: ‘Choose Thou for me my friends’ and I thought how truly blessed I had been in the friends that had been chosen for me. They are not a few; they number hundreds and are to be found all over the world. And this introduction came about so unexpectedly. I had been asked by my predecessor, Mr. Jim Trollope, to accompany him to Norwich to report the annual meeting, and on the way from the station he pointed out a young couple, remarking: ‘The handsomest couple in the Exercise.’ This couple were destined to play no little part in guiding my footsteps. I refer to Mr. and Mrs. E. A. Barnett. “That was probably the saddest Council meeting I ever attended. There was the resignation and collapse of Mr. Trollope, and during the luncheon interval Mr. G. W. Fletcher asked me to produce the next issue or two while the officers looked round for a successor and I agreed. Later there was a meeting with the officers of the Council, Mr. Lewis, Mr. and Mrs. Fletcher and Mr. A. A. Hughes, and I was in the editorial chair. “It was a case of starting from scratch. I had an exacting job and could only devote a limited amount of time to the job - mainly Saturdays and Sundays. There was nothing in the office - no papers, not even the previous week’s issue. Mrs. Fletcher was a great standby in providing copy; she wrote round to all guilds and associations, and this was a great reserve. The late Ernest Morris provided me with a pile of manuscripts, and gradually a splendid band of writers came to my aid. Some of those early contributors are still in harness. I met the committee over a cup of tea before a Standing Committee meeting which I attended to answer questions. Mr. and Mrs. Tom White with the gifts presented to them at the Central Council meeting. Mr. Wilfrid Wilson (chairman of The Ringing World Committee) is also in the picture. Unfortunately Mr. White was taken ill during the meeting at Ilkley and the photo had to be delayed. This one was taken at his home at Guildford. “The first phase of my editorship ended at Chester in 1951. A new committee was elected with Mr. Smallwood as convener, and the late Harold Poole, whose daughter is a member of the present committee. She kindly acted as treasurer to my testimonial fund. Other members were Mr. F. I. Hairs and the late Joe Dyke and they set about a big campaign for 1,000 postal subscribers - and I had my salary cut ! ! “Mr. Smallwood was responsible for the series of articles entitled ‘Servants of the Exercise’ and Mr. Wilson, who joined the committee a year or two later, contributed technical articles which were the forerunner of his classic work ‘Change Ringing.’ Mr. Smallwood was determined to build up a reserve of £10,000, and he nearly succeeded. Life membership, conferred upon him at Truro, was richly deserved, and he was succeeded by Mr. Bob Anderson. “This led up to the third phase, which started at Northampton - a year during which the committee met fairly regularly. Monthly reports were submitted and questions answered by correspondence. At that meeting there were grumblings concerning The Ringing World. Some time back the question of tinted covers was explored, but it was resolved that the extra cost involved would result in a loss in production. “The rumblings developed into a crescendo at Bath and Messrs. George Pipe and Dennis Beresford outlined a scheme for a ‘new look’ for The Ringing World. Evidence of a divided committee was presented at Worcester, but before then coloured covers had become a regular feature. I bid my farewell to a very happy committee. Our meetings have been regular and very thorough. The second part of the Interim Report was taken item by item, as with the previous one. The sub-committee appointed to report on “Membership” consisted of Mrs. E. A. Barnett and Messrs. P. A. Corby and T. J. Lock. Mr. D. A. R. May said this section should be discussed when the aims and objects were clarified. Mr. P. A. Corby, acting as spokesman, said the make-up of the Council was a hotchpotch that worked. Mr. C. F. Mew, agreeing, put forward his ideas (unfortunately often inaudible to the majority of the assembly) of a national association with national representatives elected by the body of ringers as a whole. This would have many advantages. It could predetermine numbers and resolve anomalies of belonging to many associations. The Exercise could then choose those best to serve them. It was suggested that the Council as a working body was too big, and that during the last 15 years the numbers had gone up from 150 to over 200. This did not necessarily reflect growth in numbers of ringers, but because the technical side was flourishing. Regular ringing was, unfortunately, falling. The Rev. John Scott put forward the idea of a national ringing festival, and felt the cost to the Council would be justified by bringing ringers together for a purpose. He had grave misgivings about the national v. regional bodies. Mrs. Olive Rogers supported this view and said some associations would never know about the work of the Council, and Mr. R. S. Anderson pointed out that local representatives were the only contact with local ringers. The Council were not a mandatory body. Mr. R. Meadows asked the sub-committee to consider the possibility of limiting the size of the Council, and suggestions made included increasing considerably the membership fee and reducing maximum membership from four to three. Dr. E. V. Woodcock (North Wales) said this was the A.G.M. of association representatives and national representation would be wrong. The chairman asked Mr. Mew if he wished to press the point of his suggestion and received a negative reply. He then asked the Council if they were satisfied with the present situation and the majority agreed, about ten voting against. Among others taking part in the debate were Canon Felstead, Messrs. Diserens, Dodds, Gilbert, Chaddock, Butler, Mayne, Moreton, Carlisle, W. Critchley and E. Critchley. At the close the Council agreed the proposals on “Membership” and then adjourned for lunch. RINGING overseas during 1969 generally has again been very active, with a surprisingly large movement of ringers from one country to another. Various remote towers have benefited as a result and such efforts by these ringers can only foster and stimulate improving standards of ringing overseas. Many excellent articles have appeared in the columns of The Ringing World during the year which bring the ringing fraternity closer together. AFRICA, DURBAN.- Following an encouraging year in 1968, the ringing continues to flourish. A quarter peal of Grandsire Doubles was rung in December. ZAMBIA.- News that handbell ringing has started at Kalulushi with more than a dozen keen learners is most encouraging. There are no church bells within 500 miles so perhaps 1970 may bring some reports of handbell achievements. RHODESIA.- The A.G.M. of the Rhodesian Guild was held at Salisbury, during which good ringing was enjoyed on the ten bells by ringers from Que Que, Malawi and Umvukwes. Ringing at Que Que on the four bells continues to flourish. KENYA.- An excellent article on the bells and ringers of Kilifi by Barry Couzens appeared in The Ringing World following his visit there, which confirms the sustained keenness and improving ringing standards by the locals on their very light ring of six. ANZAB.- Ringing “down-under” during 1969 has again been stimulating, although it is disturbing to hear of trouble with Perth tower as a result of recent earthquake effects. To ring the 29 rings of bells in Australasia there are some 200 active ringers. The majority of the bells were installed in the 19th century and ringing can at times be very hard work; it is, therefore, pleasing to note that in 1969 complete restoration and augmentation to eight bells has been put in hand at Parramatta, Sydney. MELBOURNE.- At the Cathedral two peals and 31 quarters were rung, which include Bob Maximus, Yorkshire S. Major and Stedman Caters. This is very creditable. SYDNEY.- St. Mary’s Cathedral, Burwood, Turramurra and Parramatta have recorded some dozen quarter peals in a variety of methods. In Hobart and Perth ringing has been badly affected by ringers moving away and by the bells falling into further disrepair. It is indeed sad to note that the oldest ring (1847) at Holy Trinity, Hobart, is seldom rung, although the two Victorian towns of Bendigo and Ballarat - with three eights between them and two recently restored - are working hard together to recruit and train, and hope to show the rest of Australia a thing or two before long. Evidence either by report or in the quarter peal columns of activity in Adelaide is meagre. An account in The Ringing Towers of a “brawl” in the correspondence columns of the Advertiser over the sound of the Cathedral bells testifies to the fact that ringing goes on. At Prospect, in the suburbs of Adelaide, there is also news of the impending installation of a new ring of bells. CHRISTCHURCH.- Ringing has been somewhat diminished by losses of ringers to travel - a hazard to which a band with so many Ph.D.s engaged in high-powered research and education must surely be prone. HAMILTON, which is somewhat isolated, is thrown very much on its own resources for recruitment and teaching. It is, nevertheless, precisely recorded that since the bells were installed in 1950 they have been rung 3,390 times, which averages more than three times a week, which is surely a record of which any tower may be justly proud. During 1969 the controversy over the carillon being given by the British Government to the Australian Government for the city of Canberra has been settled by the casting of the bells. A special meeting of ANZAB in England was called in September to witness this. The bells are to be installed by mid-1970. CANADA.- The year 1969 has shown considerable activity in the sphere of handbell ringing by six peals (of Plain Bob and Kent T. Bob) having been rung for the North American Guild at Hamilton, Toronto, Islington and Mississauga. At Calgary one quarter has been reported, showing continued activity by the local band. A quarter was rung at Vancouver, B.C., which is a slight decrease on the 1968 achievements. No news has been received from Victoria or Mission City, B.C., although it is understood that service ringing continues. AMERICA.- Ringing in U.S.A. has been enhanced by the visit to England during 1969 of three of Russell Young’s ringers - Even Cowles, Chris Biddle and David Walton - from Groton School, Joan Hutchinson from Smith College (who learnt much about the bellfounding business whilst working at the Whitechapel Foundry), Marjorie Batchelor and Rick Dirksen from Washington Cathedral. All these ringers rang in at least one peal while here. A tour of England and the Low Countries was made by the Potomac English Handbell Ringers, under the leadership of that inimitable lady Mrs. Nancy Poore-Tufts. Concerts were given in Holland, Norway, Paris, Oxford, Llandaff, Chester, Keswick and Edinburgh and gave great pleasure to those who attended. Efforts to co-ordinate ringing between the North American towers have proved successful by visits by the Washington ringers to Groton and Kent Schools and Smith College, despite the vast distance travelled, during which a quarter was rung at Groton by the combined bands, and of the second North American tour arranged by Liz and Geoff Davies. It would be, most encouraging in the North American Guild were more consolidated rather than being somewhat a title of convenience. We look forward to further visits to this country by our ringing friends from the New World. Ringing World photos of some of the participants in the Monday dales tour. Among others may be seen: J. H. Bluff, F. E. Collins, J. T. Dunwoody, G. T. Couzens, W. Oatway, Anne Pearce, A. V. Davis, W. Ayre, Mrs. Gillian Davis, Catherine Davis and F. A. Munday. Finance.- The section had been prepared and presented by Messrs. D. Beresford, F. C. Price and W. G. Wilson, the first-named acting as spokesman. Mr. G. W. Critchley asked if The Ringing World accounts were to be discussed and it was pointed out that as these were audited separately and the accounting system had recently been revised, it was not considered necessary at this stage for these particular finances to be the subject for general debate. The question of a false surplus in The Ringing World accounts on the year’s working was raised, and Mr. Meadows, supporting Mr. Critchley, said it was understood it was done to save taxation. Mr. Wilson replied that the whole question was covered by the last paragraph of the report, and this was accepted. On the point of liability, the secretary stated that the Council was covered, and Mr. R. S. Anderson spoke of the possibility of forming The Ringing World into a limited company. Mr. Beresford stated that on professional advice there would be no advantage. Mr. P. Gray said there were, he believed, certain reserves and he asked the committee what should be the size of these in the case of liability. Mr. Beresford said there was no liability, and in any case they were covered by insurance. The Towers and Belfries Committee expenses were next discussed and the opinion was expressed that this committee should be self-supporting and charge for work done and advice given. Mr. Frederick Sharpe explained the system which was adopted by its members and said no charge was made for time, but expenses were collected if possible. They were all out of pocket at the end of the year. The convener did, however, charge for postages and for travelling to committee meetings. The chairman said the sub-committee had considered all the points. It was suggested by one speaker that churches where advice had been given should be advised as to costs involved, and he was told that this had been done in many cases, but with little response. Mr. C. K. Lewis asked a question about increasing the Central Council subscriptions (the present 10s. per member has remained unchanged since 1954) and the chairman advised that the Standing Committee revise the report, including subscriptions, and resubmit it next year, making resolutions as necessary. Considerable discussion followed, Messrs. Carlisle, Wilson, Mayne, Reynolds and Rev. J. Scott taking part, and finally the whole Interim Report was put to the meeting for acceptance and agreed, no one voting against. The sub-committee will now review their reports in the light of the proposals and general discussion, and will resubmit the complete report next year with definite proposals. The Council then proceeded to deal with various motions of which notice had been given. Proposing that the Council donate £20 to the Gloucester and Bristol special appeal for Stinchcombe bells from the Clement Glenn Fund, Mr. E. A. Barnett received secondary support from Mr. V. Bottomley. Answering Mr. Butler’s question as to whether the money would go to the bells or to support the case, Mr. Wratten stated that all money donated was for the bells. The costs were being paid by the association. Mr. Hoare said this created a dangerous precedent, whilst Mr. Seager added that if it were a test case more effort should be made. Following a remark that this was confusing the issue, Mr. Gray made two points which he thought it fair to repeat for the benefit of the members. The two principles were: (a) If ringers can do anything to influence against bells being hung dead it was imperative to do so, and (b) The way the chancellor gave his decision. There was a risk that if the Stinchcombe appeal was widely supported other P.C.C.s would apply for faculties for their bells to be hung dead to get the support of ringing associations for the rehanging. The Rev. St. J. Smith interjected that he did not think P.C.C.s would sink as low as that. Answering a question as to raising a local band to ring the bells once they were rehung, Mr. C. Wratten said there were two ringers in the parish and there seemed no reason why a team should not be trained. He felt, because of the chancellor’s judgment, the burden should not fall entirely on the parish. Mr. Sharpe pointed out that the chancellor’s ruling only applied to his own diocese and was not legally binding on anyone else outside that area. Mr. Dodds: I think we should support the appeal. On being put to the meeting the proposal was carried, about ten voting against. COURSES.- The three-day course at Hereford Training College at Easter, 1969, organised by Mr. Wilfrid F. Moreton and the Hereford Guild, was attended by 40 resident students and 20 day students - 60 in all. Three days seemed to be the ideal length, about half the time being spent in the local towers. Students were split into groups with competent helpers for each tutor. Messrs. N. Chaddock, W. F. Moreton and F. Sharpe assisted on the Lincoln Guild residential weekend course at Brant Broughton in March. The former and present directors of education attended the Saturday evening activities end thoroughly enjoyed themselves. In November the annual residential weekend course, organised by Mr. Norman Chaddock for the West Riding Education Authority, attracted 39 students, although 30 was the limit at first allowed. On May 10 a full day course at Market Weighton, E. Yorks, organised for the Beverley and District Society, at Market Weighton Secondary School, involved 124 ringers and eight local towers. The course was split into three main sections covering a wide range of topics and activities at different levels. An evening institute course was also run by Mr. N. Chaddock at Market Weighton during both winter sessions in 1969. Gramophone record illustrating good striking. The master tape for this is almost completed, the artist is working on the illustrations to go on the front cover of the record sleeve and the instructional notes to go on the back are ready for the printers. All being well this project will be completed before Whitsuntide. This was completed last May and copies have been on sale for some time. This has been hired out 13 times during 1969 producing a net profit of £11 3s. 2d. As requested, the convener passed over his “file” on this matter to the new committee formed to advance this project. The period of decline of this installation is at an end. Following visits, contacts and negotiations by the convener and helpers it is anticipated that this fine ring of bells is entering a new era. Appropriate detailed reports have been or will be made in the columns of The Ringing World. These include requests for loan of visual and aural aids, filmstrips end films. Advice has been given to two applicants on the organisation and syllabuses of evening institute courses. Several requests for the convener’s filmstrip on bell control have been met. Mr. Dodds remarked that many would not know what they were voting on. Mr. E. A. Barnett queried whether conductors could put calls wherever they liked, and Mr. W. B. Critchley said he would hesitate to comment too strongly but would support Mr. Barnett’s query. Mr. D. E. Sibson spoke of dual bobs in a peal of Kidderminster and also two singles in Superlative. Suggesting they refer again to the report of the sub-committee, Mr. C. K. Lewis said he did not wish to put obstacles in the way of experiment, but emphasised that it was not to be treated lightly. Offering to consider the whole question again in the committee, Mr. J. Mayne said it was difficult for that body to decide what course to take. Messrs. Carlisle, Corby and Diserens made various observations, the latter remarking that people would ring just what they wanted to, but Mr. D. Beresford questioned how much of the composer’s art was lost in a conglomeration of calls. Mr. S. Ivin stated that problems were created by the use of such calls, and Mr. Ayre said had he known of such irregular calls he would not have accepted peals of Surprise with singles. Upon being put to the meeting, Motion 9 b (A) was carried by 26-9 and 9 b (B) (1) also, but without opposition. 9 b (B) (2) was accepted without dissent, although three-quarters of those present, not understanding the technicalities or implications, did not vote, it being obvious that many had no notion of what was being debated. created more interest, however, for this was understood as revising the rules regarding long length records. It was pointed out that the present rules as laid down had not been complied with in regard to the long length of Superlative in September and the London Royal in January, but the Little Bob Major proposed attempt was postponed when it was found insufficient notice had been given. The question now asked was: Is the Council prepared to enforce its rules? Mr. R. B. Smith said that if paragraph 2 (b) of last year’s minutes were deleted then he would agree that the Superlative was a record length, but nobody could legally stop publication of the peal. Mr. Beresford pointed out that The R.W. was the property of the Central Council and would publish what that body required. Record lengths were the property of the Exercise, handed down by tradition, and all would want to regard them as such. He asked the members to reject the motion and enforce the rules. Mr. Mayne asked Mr. Smith if it mattered very much to him (Mr. Smith) what peal superseded the previous record, and Mr. Smith replied in the affirmative, adding that he was convinced the peal was rung, but that the Council should have dealt with the matter straight away. Mr. Mayne then observed that his question had been answered, and Mr. Smith and all should realise the need for safeguarding such record attempts. He hoped the motion would be rejected. After Rev. St. John Smith and Mr. W. Ayre had made observations, the motion was put by the chairman and heavily defeated, only about ten voting in its favour. The figures for peals rung in 1969 show an increase again, mainly by the activities of certain people and bands - the total (E. & O.E.) being 3,807, made up of 3,459 tower-, an increase of 332, and handbells 348, an increase of 14. First pealers have increased from 543 to 555 - an additional 12, with 83 first as conductor - giving +4 over 1968. We welcome all these but should be delighted to see a more substantial increase in this latter section. There is a change in the table this year, with the Yorkshire Association well ahead - by 72 peals - as shown below. These nine give 41.94% of the total. Missing from the peal columns are:- British Rail, Cleveland and N. Yorks, Devon Assoc., Dudley and Dist., E. Derby and W. Notts, Ladies’ G., Scottish A., Sheffield and Dist., S. Derby and N. Leics. For the Investiture of H.R.H. the Prince of Wales we noted 39 peals; for his 21st birthday 22. We are delighted with the smaller number of duplications this year. It would seem that more advantage could be taken of these royal occasions. It is also expected that some members with particular knowledge of local circumstances, etc., may feel we have not given all performances of special mention. Tower bells.- Bath and Wells, increase in multi-method/variations, peals of Doubles; Chester G., 75 Spl. Surp. Maximus; Coventry G., 81, 63, 45 Spl. Surp. Minor; Hertford C., 11,520 Eardisland Delight; Lancashire A., 50 Spl. Surp. Maximus; Lincoln G., 117 T.B. Minor, 186, 157, 144, 135 m/v Doubles; R. Soc. Cumberland Youths, 9 peals S.S. Major on same day, ranging from 24 to 8 meth. ; Southwell G., Spl. T.B. Minor in 210 (2), 198, 179, 155, 127 and 117 methods; Truro D.G. in exploration and progression in Doubles m/v; Winchester and P’mouth 7,168 in 32 S. Surp. Major with all the work, and 223, 151 m/v Doubles; Yorkshire A., 126, 102 m/v Doubles. There appeared to be a feeling of relaxation among those present when Item 10 on the agenda was announced. This involved the acceptance of the various reports of committees which had already been printed and circulated and little discussion on each was apparently anticipated. The first report, that of the Literature and Press Committee, was accepted after Mr. Edgar Shepherd had asked if “Overtones” was still appearing and Mr. Sharpe had confirmed that it was. Item 10 (b), the report of the Biographies Committee, was approved without comment and was followed by that of The Ringing World Committee. Mr. Wilfrid Wilson expressed sincere thanks to the members and past members of The Ringing World Committee and apologised to Mr. W. B. Cartwright for having omitted his name in the report, as he had helped considerably in the legal side of the affairs of the committee. Mr. Wilson also stated he had not yet found the time to answer certain letters addressed to him as convener, but hoped to do so very soon. The Ringing World was this year publishing an illustrated calendar, a “Year to View” on each monthly page, and also space for weddings, meetings and other relevant data. Sample sheets were circulated to those present and it was stated that the calendar would retail at 6s. including postage. Orders were being taken during the meeting. The cost of producing The Ringing World had been kept to a minimum, but it was feared that there would of necessity be a rise in the price next year due to increased wages and higher paper costs. Following a question by Mr. Hartless as to whether there ought not to be a charge of 1s. per name in the peal reports, Mr. Wilson said it would cost more to collect the shillings than was worth while, and the committee were very reluctant to introduce such charges. He expressed thanks to Messrs. D. Beresford and G. Pipe for help given in the past to The Ringing World. Mr. Dodds said if charges for peals were introduced there would be no guarantee that all peals would be sent to The Ringing World for publication. It was essential that all peals were printed, or records would not be complete. Mr. Reynolds stated that the Lancashire Association made a charge of 1s. per rope, 6d. going to the association and 6d. to The Ringing World, the full amount being sent once a year. That the peal layout was all right for recording, was Mr. Roper’s comment, but the quarter peal format was awkward. Mr. Mason suggested that uniformity was essential. Mr. Wilson said that the technical questions asked could be answered by the Editor, and asked the permission of the chairman for Mr. Denyer to speak, which was granted. Thanking the Council for accepting him as an honorary member, Mr. Denyer endeavoured to explain the technical details of production, and appealed to those present to make every effort to increase the circulation of the paper, to help the printers by sending in good copy, written on one side of the paper only, and not to delay in sending in reports and advertisements. Many correspondents did not supply full details, which caused considerable holdup and unnecessary expense. The editorial department was often blamed for late publication of items of news, peals and quarter peals, when in point of fact many reports were late - some very late - in being submitted. He thanked the many ringers who had advised, helped and encouraged him in his task, and asked for patience and cooperation in the future. Mr. Ayre asked that proper alphabetical order be adhered to in the peal reports. Considerable merriment was caused by a quick retort by Canon Felstead that such an arrangement would ruin his records and asked that they remain as now printed. Mr. W. E. Critchley proposed and Mr. R. F. B. Speed seconded that the Peals Collection Report be approved, and this was carried without comment. The Overseas Report, when proposed and seconded, brought a query from Mr. G. W. Pipe about the condition of ropes in Rhodesia, where there was considerable ringing activity. He asked if there was any way of “getting round” rules and cutting red tape to supply ropes to Rhodesia. Mr. Frank Blagrove offered to advise on the matter. Handbells.- The friendly rivalry between the Chester G. and Hertford County bands, with the Chester G. achieving Kent T.B. 14, S. Surp. Max. in 3, 4, 6, 10 and 12 methods and S.S. Royal in 2, 4, 5, 6, 7, 8 methods. The Hertford C. band rang two peals of Kent T.B. 16, 1 Little B. 16 and 4, 6, 8, 10 S.S. Max. ; Leicester D.G. the Cambridge sequence on one day. Middlesex C., two peals Kent T.B. 14; Hertford C., 32 S. Surp. Major; N. American G., peals of Plain Bob and Kent T.B. Major. The coldest - we expect - Bob Minor, north of the Arctic Circle, for the Durham and Newcastle A.
Basingstoke - Winchester and P’mouth: Erin Caters - no cover. Basingstoke - Winchester and P’mouth: Minimus on handbells. A. Soc. College Youths.- Max 17, Cinques 9, Royal 3, Major 12, Triples 1. Total 42. ANZAB.- Caters 1, Triples 1, Minor (2). Total 4 (2). Bath and Wells.- Cinq. 1, Royal 4, Caters 2, Major 52, Triples 10, Minor 62½, Doubles 45½. Total 176. Bedfordshire.- Royal 5, Caters 1, Major 12, Triples 2, Minor 17. Total 37. Beverley and Dist.- Max. 1, Royal 1, Major 3, Minor 2. Total 7. Cambridge Univ.- Cinq. 1, Royal 1 (2), Caters 2 (1), Major 16 (3), Triples 2. Total 28 (6). Chester D.G.- Fourteen (1), Max. 4 (16), Cinques 1, Royal 5 (21), Caters 4 (1), Major 65 (19), Trip. 7, Minor 34 (5), Doubles 8 (2). Total 193 (65). Cleveland and N. Yorks.- Nil. Coventry D.G.- Royal 3, Caters 2 (1), Major 28, Trip. 3, Minor 27, Doubles 6. Total 70 (1). Cumb. and North W’land.- Minor 3. Total 3. Derby Dio. Assn.- Royal 13 (3), Caters 1, Maj. 32 (4), Trip. 2, Minor 21 (14), Doubles 3. Total 93 (21). G. of Devonshire.- Max. 1, Royal 2, Caters 1, Major 29, Trip. 10, Minor 11, Doubles 3. Total 57. Durham and N’castle.- Max. 1, Cinq. 1, Royal 1, Caters 1, Major 34, Minor 3 (2). Total 43 (2). E. Derby and W. Notts.- Nil. E. Grinstead and Dis.- Major 1. Total 1. Ely Dio.- Cinq. 1, Royal 1, Major 34, Trip. 1, Minor 14. Total 51. Essex Assoc.- Max. 4, Cinq. 4, Royal 4, Caters 2, Major 58, Trip. 4, Minor 27, Doubles 3. Total 106. Gloucester and Bristol.- Max. 3, Cinq. 2, Royal 7, Caters 1, Major 25 (7), Trip. 6, Minor 9 (2), Doubles 6. Total 68 (9). Guildford G.- Max. 1, Royal 6, Major 64 (2), Triples 3, Minor 14, Doubles 3. Total 93 (2). Hereford G.- Caters 3, Major 10 (2), Triples 4, Minor 15, Doubles 4. Total 38 (2). Hertford C.- Sixteen (3), Max. (13), Cinq. (1), Royal 5 (12), Caters 2 (1), Major 54 (29), Triples 5, Minor 19 (1), Doubles 2. Total 147 (60). Irish Assoc.- Major (2), Doubles (1). Total 3 (3). Kent County.- Max. 6, Cinq. 1, Royal 2 (4), Caters 4 (1), Major 71 (4), Trip. 12, Minor 37 (6), Doubles 4. Total 152 (15). Lancashire A.- Max. 4, Cinq. 3, Royal 10, Caters 4, Major 77, Trip. 8, Minor 42 (26), Doubles 4, Minimus 3. Total 181 (26). Leicester D.G.- Max. 4 (1), Cinq. 2 (2), Royal 28 (1), Caters 3, Major 87 (12), Trip. 7 (1), Minor 35 (2), Doubles 2 (1). Total 188 (20). Lincoln D.G.- Max. 5, Cinq. 6, Royal 4 (1), Caters 3, Major 13 (11), Trip. 2, Minor 51 (2), Doubles 18. Total 116 (14). Llandaff and M’mouth.- Max. 1, Cinq. 2, Royal 6, Caters 9, Major 25 (1), Trip. 6, Minor 10, Doubles 11. Total 71 (1). London County.- Royal 6 (1), Caters 1, Major (4), Minor (1). Total 13 (6). Middlesex C.- Fourteen (2), Max. 1, Royal 4. Caters 3, Major 33 (1), Trip. 5, Minor 4. Total 53 (3). Midland Counties.- Royal 1, Caters 3, Major 31, Trip. 5. Total 40. National Police G.- Minor 1, Doubles 1. Total 2. North Staffs A.- Royal 2, Major 11, Trip. 1, Minor 2, Doubles 2. Total 18. North Wales.- Caters 1, Major 4. Total 5. Norwich D.- Max. 2, Cinq. 1, Royal 4, Caters 1, Major 20, Trip. 1, Minor 32 (1), Doubles 5. Total 67 (1). Oxford D.G.- Max. 3, Cinq. 1, Royal 6 (2), Caters 5, Major 67 (4), Trip. 28, Minor 21 (10), Doubles 6. Total 153 (16). Oxford Society.- Cinq. 1, Caters 3, Major 1, Trip. 1. Total 6. Oxford Univ.- Major 4 (1), Minor 1. Total 5 (1). Peterborough D.G.- Max. 2, Royal 13, Caters 2, Major 45, Trip. 2, Minor 61, Doubles 17. Total 142. St. David’s D.G.- Major 5, Minor 3, Doubles 2 (1). Total 11 (1). St. Martin’s G.- Max. 18, Cinq. 1, Royal 14, Major 38, Trip. 4. Minor 1. Total 76. Salisbury D.G.- Max. 1, Cinques 1, Royal 3, Major 44, Trip. 6, Minor 30 (2), Doubles 5, Minimus 1. Total 93 (2). Shropshire A.- Caters 2, Major 2, Triples 1, Doubles 3. Total 8. South Derby and North Leics.- Nil. Soc. Royal Cumb. Youths.- Max. 9, Cinq. 2, Royal 6, Major 32, Trip. 1. Total 50. Soc. Sherwood Youths.- Cinq. 1, Royal 2 (1), Major 3, Minor 1. Total 8 (1). Southwell D.G.- Max. 1, Cinq. 2, Royal 2, Caters 2, Major 12, Trip. 6, Minor 76½ (1), Doubles 35½ Minimus 3. Total 141 (1). Stafford Archy.- Max 2, Cinq. 1, Royal 4, Caters 6, Major 23, Trip. 9, Minor 16, Doubles 1. Total 62. Suffolk G.- Royal 10, Major 65, Trip. 1, Minor 38, Doubles 10. Total 124. Surrey Assoc.- Cinq. 3, Royal 1 (1), Caters 4, Major 26 (1), Trip. 3, Minor 5 (11), Doubles 2. Total 57 (13). Sussex County.- Royal 2, Caters 2, Major 29, Trip. 10, Minor 17, Doubles 3. Total 63. Swansea and Brecon.- Major 3 (1), Trip. 2, Minor (3), Doubles 1, Minimus 1. Total 11 (4). Truro Dioc.- Caters 1, Major 9, Trip. 9, Minor 7, Doubles 24, Minimus 1. Total 51. Universities A.- Major 2 (5), Minor 2 (2). Total 11 (7). Univ. of Bristol.- Cinq. 2, Caters 2, Major 2, Trip. 1, Minor 6. Total 13. Univ. of London.- Major 1, Minor 4 (5). Total 10 (5). Univ. of Manchester.- Major 6 (2), Trip. 1, Minor 1 (5). Total 15 (7). Winch. and Portsmouth.- Max. 1, Cinq. 2, Royal 7, Caters 7, Major 42 (3), Trip. 6 (1), Minor 18 (1), Doubles 21 (1), Minimus 1. Total 111 (6). Worcs. and Dist.- Max. 3, Cinq. 1, Royal 2, Caters 2 (1), Major 41, Trip. 16, Minor 15, Doubles 6, Minimus 2. Total 89 (1). Yorkshire Assoc.- Max. 2, Cinq. 5, Royal 26 (1), Caters 4 (1), Major 168 (4), Trip. 5, Minor 38 (2), Doubles 7. Total 263 (8). Other Societies, etc.- Max. 1, Cinq. 2, Royal 5, Major 31 (9), Trip. 5, Minor 6 (7), Doubles 1. Total 67 (16). 40 m/v and over 39. Life members: E. A. Barnett (vice-president), V. Bottomley (hon. secretary and treasurer), J. Freeman (president), F. W. Perrens, F. Sharpe, E. C. Shepherd, Canon A. G. G. Thurlow, T. W. White. Hon. members: Mrs. O. D. Barnett, Mrs. J. E. Bottomley, F. E. Collins, J. L. Garner-Hayward, D. Hughes, S. J. Ivin, C. K. Lewis, J. R. Mayne, H. N. Pitstow, G. W. Pipe, H. L. Roper, R. B. Smith, R. F. B. Speed, Mrs. R. F. B. Speed, P. L. Taylor. College Youths: W. T. Cook, J. S. Mason, R. B. Meadows, W. Williams. A. and N.Z.A.- P. M. J. Gray. Bath and Wells.- J. H. Gilbert, E. Naylor, A. H. Reed. Beds.- J. H. Edwards, K. H. Fleming. Camb. University.- C. M. P. Johnson, B. D. Threlfall. Chester.- H. C. Lonyon, D. Mottershead. Coventry.- Mrs. D. E. Beamish, H. M. Windsor. Cumb. and N. Westmorland.- R. W. D. Wetenhall. Derby.- D. R. Carlisle, G. A. Halls, Rev. R. D. St. John Smith. Durham and Newcastle.- K. Arthur, D. A. Bayles. Ely.- J. G. Gipson, H. S. Peacock. 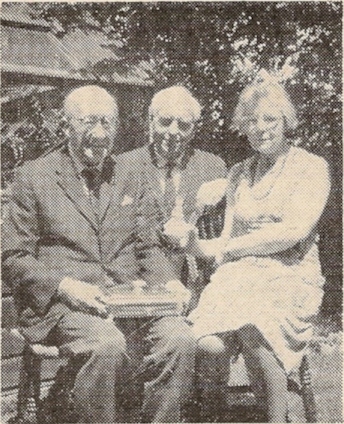 Essex.- J. Armstrong, F. B. Lufkin, Miss H. G. Snowden. Glos. and Bristol.- A. L. Barry, A. R. Peake, J. R. Taylor, C. A. Wratten. Guildford Dio.- D. A. R. May, T. Page, P. G. Smart, W. H. Viggers. Guild of Devon Ringers.- Fr. P. Angold, D. R. Bould, Rev. J. G. M. Scott. Hereford Dio.- P. Hughes, J. F. I. Turney, A. T. Wingate, P. J. H. Wycherley. Herts.- W. Ayre, B. M. Barker, R. G. Bell, G. Dodds. Irish.- P. W. Brown, F. E. Dukes, J. T. Dunwoody. Kent.- P. A. Corby, S. Jenner, I. H. Oram, C. A. Tester. Ladies.- Miss J. Beresford, Miss D. E. Colgate, Mrs. P. J. Staniforth. Lancs.- N. Bennett, C. Crossthwaite, J. P. Partington, F. Reynolds. Leicester Dio.- D. Burton, J. M. Jelley, P. J. Staniforth, B. G. Warwick. Lincs Dio.- J. Bray, G. E. Feirn, J. L. Millhouse, P. Reynolds. Llandaff and Mon.- Mrs. D. J. King, T. M. Roderick. London County.- H. W. Rogers, Mrs. H. W. Rogers, G. W. Shanks, W. G. Wilson. Middx.- F. T. Blagrove, G. W. Critchley, T. J. Lock, C. H. Rogers. Nat. Police Guild.- N. A. Bagworth. North Staffs.- R. S. Anderson, C. S. Ryles. North Wales.- Dr. E. V. Woodcock. Norwich.- P. M. Adcock, H. W. Barrett, M. Cubitt, N. V. Harding. Oxford Dio.- W. Butler, N. J. Diserens, F. C. Price, P. Walker. Oxford Society.- F. A. H. Wilkins. Oxford University.- J. E. Camp, D. J. Roaf. Peterborough Dio.- E. Billings, J. H. Bluff, B. Hendry. Railway Guild.- E. J. Franklin. St. Martin’s.- G. E. Fearn, R. W. Pipe. Salisbury.- J. T. Barrett, E. J. Hitchins, G. S. Morris. Sheffield and Dist.- J. Seager. Society Royal Cumberlands.- J. P. Baines, D. Beresford, W. H. Dobbie, D. E. Sibson. Society Sherwood Youths.- G. A. Dawson. South Derbyshire.- J. E. Collins. Southwell.- J. D. Clarke, W. L. Exton, R. B. Mills, H. Poyner. Staffs.- C. F. W. Eyre. M. W. Fairey, C. M. Smith. Suffolk.- T. N. J. Bailey, H. W. Egglestone, C. W. Pipe, Rev. L. R. Pizzey. Surrey.- A. P. Cannon, S. F. W. Kimber, C. F. Mew. Sussex.- J. R. Norris, R. W. R. Percy. Truro.- W. C. Boucher, F. M. Bowers, A. J. Davidson, A. Locke. Universities Assn.- Rev. M. Melville. University of London.- A. J. Frost. University of Manchester.- M. C. W. Sherwood. Winchester and Ports.- A. V. Davis, Canon K. W. H. Felstead, J. Hartless, R. R. Savory. Worcs. and District.- B. C. Ashford, D. Beacham, W. B. Cartwright. Yorks.- N. Chaddock, W. E. Critchley, D. S. Johnson, W. F. Moreton. A Ringing World photo taken outside the Troutbeck Hotel, Ilkley, of four West Country ringers who attended the Central Council meeting. 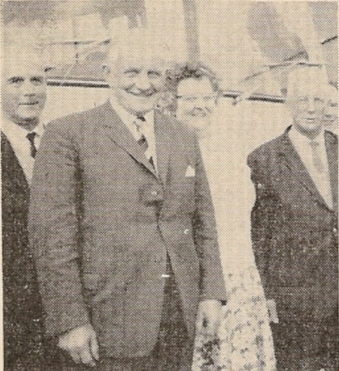 Mr. A. J. Davidson stands at the back, and the others are A. Locke, Anne Pearce and F. M. Bowers. Continuing the discussion and acceptance of the reports of various committees (Item 10), the Sunday Service and Education Committee convener, Mr. N. Chaddock, spoke of the making of a gramophone record, illustrating good striking on 5, 6, 8 and 10 bells. He gave the costs involved in its production as up to £124 for 99 discs - the number necessary to avoid paying purchase tax. He suggested the cost would be 35s. each record and that the ringers who had helped in the making of the record should be given a free disc. There might be a profit of £20, but this was doubtful. When possible it was intended to advertise it in the R.W. so that individuals and towers could order the record. Mr. Speed said 99 records were not many and asked what would be the purchase tax if another pressing were made. Mr. Chaddock replied that 99 was the original number agreed, and the churches concerned granted the use of their bells on the understanding it was a non-profit making business. If more discs were cut it would be necessary to have the further approval of the churches involved. Mr. C. Pipe asked who chose the bells to be recorded and why. Mr. Chaddock answered that it was the towers with attractive bells and which were available for recording on Sunday afternoons. The Council approved the necessary expenditure for the record. On the educational side of the report Mr. Butler pointed out that there was no report from the southern part of the country. He suggested courses should be arranged for tower captains and also a possible Sunday service ringing survey organised. Mr. Davis asked if the record to be made would be suitable for broadcasting, and if so would it be construed as the Central Council encouraging it for service use. After Mr. Chaddock had replied that it was not suitable for broadcasting, the Rev. St. John Smith suggested that for theological colleges, the Guild of Clerical Ringers might liaise with the committee. The Inveraray bells restoration was mentioned and Rev. J. Scott testified to the work and co-operation between Mr. Chaddock and his team and Mrs. Noble, who was behind the project. Among other suggestions made were a prize for film making, that articles on rope splicing be included in future issues of the committee’s publication and that Mr. Butler be added to the committee, he to undertake the Sunday service survey. Following agreement to this, and that Mr. Chaddock would consider the suggestions made, the report was approved. Two points brought forward from this report were the peal of Erin Caters on the nine bells at Basingstoke and the peal of Minor, with a cover, at Sawston, Cambs. Canon Felstead said he hoped the peal of Erin Caters would be accepted, and when Mr. Warwick asked if the musical implications had been considered he replied that they had. Mr. R. Savory (master of the Guild of which Basingstoke is part) said he had taken part in the peal himself and it was quite musical. He also hoped the peal would be accepted by the Council. Mr. Crossthwaite said that the Winchester peal had not been accepted and asked if the convener had included the peal of Minor at Sawston. Mr. Ayre replied that it had not been printed in the R.W. peal columns, therefore it was not in the analysis. The chairman asked why the band had rung Erin Caters at Basingstoke, to which Mr. Savory replied that the a local ringer wanted to ring a peal in their own tower. Mr. Savory proposed and Mr. Blagrove seconded that the Erin Caters be included, and this was agreed, four voting against the motion. Mr. F. E. Collins asked if this would legalise all other 9-bell peals at Basingstoke and received a negative reply. Mr. C. Crossthwaite proposed that the peal of Minor with cover at Sawston which had five first pealers in it and which was rung to celebrate the Prince of Wales’ 21st birthday (on the anniversary of a peal rung on the day of his birth) be accepted. Mr. Peacock seconded and this also was carried, six voting against. Mr. Dodds asked for the exclusion of the peal of Spliced Major rung for the Herts Association as it was false, and Mr. Threlfall asked the convener to bring doubtful peals to the Council to decide on acceptance or otherwise. Mr. Ayre replied that he had been let down too many times in the past. Mr. Mew asked whether long lengths which were not accepted as records qualified as peals, and Mr. Lufkin said that the committee must work to rules and not offer opinions. Mr. Corby expressed the sympathy of all on the withdrawal of the multi-Maximus effort, which was an outstanding performance but had been proved false. When the Records Committee report was proposed for acceptance by Mr. Blagrove, Mr. Lewis seconded and queried the names given to some methods. He suggested that “Mr.” be dropped from “Mr. Rusty” as a method name. Mr. Blagrove said the naming of a new method was the prerogative of the band ringing it, but Mr. G. W. Pipe said the names should be chosen sensibly - not childishly. Mr. Seager suggested that the Council should have the power to rename a method - if it had not already that power. Mr. Mayne replied that the Council could claim powers to rename a method. Mr. Cyril Wratten asked the whereabouts of three manuscripts: (a) James Barham’s peal book, (b) any papers left by Henry Davis, and (c) Parnell manuscripts, and, if anyone knew about them, to communicate with him. The Towers and Belfries Committee report was accepted, Mr. Sharpe expressing thanks to Mr. W. B. Cartwright for his help in legal matters, and others who had assisted in many ways. Considerable discussion took place on the report of the Broadcasting Committee, acceptance of which was proposed by Mr. H. N. Pitstow, seconded by Canon A. G. G. Thurlow. Mr. W. G. Wilson spoke of a colour film being made by the B.B.C. and Mr. Pipe mentioned the poor recording made of the Elstow (Beds) bells. Among comments and suggestions made during the discussion were that the B.B.C. would not be intimidated; that Leicester ringers were asked to record Stedman Cinques for the B.B.C. but nobody came near the belfry; that the Council should give more support to the committee and the new Publicity Committee; that the B.B.C. were to make a record of bells for sale to church authorities and ringers, but that they (the B.B.C.) would choose the towers and bells; that the towers chosen were to be given a free disc, and that there was no copyright to the recordings. At the close of this debate Mr. Chaddock asked Mr. Wilson if a copy of the colour film being made could be obtained, and Mr. Wilson assured him that every endeavour would be made to that end. Item 10 (K) was the report of the Methods Committee, and its acceptance was proposed by Mr. C. K. Lewis, with Mr. S. Ivin seconding. Great difficulty appeared to be experienced by a good percentage of the Council to understand (or follow) the debate which ensued. Mr. Jelley stated that in 1959 a precedent was set when two methods of the same name, one of Major, the other Royal, were rung, the extension not being orthodox, and the band were asked to change the name of one of them, and this was done. The methods discussed now were Leatherhead and Kegworth, and Messrs. Mayne, Blagrove, Seager, Speed, Barnett, Beresford and Dodds all took part in cross-talk of technical method construction. This resulted in Mr. P. A. Corby remarking that the behaviour of certain people was becoming increasingly worrying, apart from the considerable time being spent on trivialities. Mr. R. S. Anderson, following up this cue, promptly proposed that the Council move on to the next business, which received general approval. The Methods Committee’s report was adopted, three voting against. For the final report, about the general interest film, Mr. Bottomley said that the cost of this was increasing, and it was not right to put the Council’s money at risk. However, the name of a contact at the B.B.C. had been passed on by John Betjeman, and with this information the report was accepted. 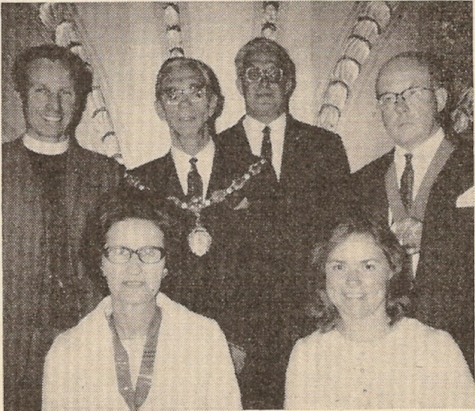 For the Central Council meeting in 1971 it was announced that the Coventry Association would be the hosts, but no actual centre had yet been chosen. Mrs. Beamish (master) stated that an announcement on the headquarters chosen would be given in due course. The Spring Bank Holiday week-end is again to be the dates for the Council’s assembly. When asked where the Council would like to meet in 1972, it was asked if London was a possibility. Exploratory inquiries are to be made as regards this suggestion. Canon Thurlow suggested the Council might consider returning to the real Whitsun week-end for its meeting so as to avoid holiday traffic and accommodation problems. When the chairman announced this final item on the agenda, the Rev. J. Scott invited the Council to visit Devon in 1974, which would be the centenary year of the Guild of Devonshire Ringers. The gathering expressed disappointment when it was voiced that for the first time ever a member who was a Benedictine monk (a Roman Catholic), Father P. Angold, and who had been unable to be welcomed last year, had been present at the Council’s discussions but had not been formally welcomed as a new member. However, it was found that the Reverend Father had just left the meeting and could not, once more, be introduced. Mrs. Staniforth asked that the official welcome by the civic dignitaries be arranged in future as for this year - on the Monday evening - leaving Tuesday free for the business meeting. Thanks to Mr. Garner-Hayward for his services in connection with the Central Council publications were expressed on the proposition of Mr. W. F. Moreton, and Mr. Cartwright called on the assembly to show its appreciation to Mr. John Freeman (president) for his tolerance, skill and judgment and capable handling of the meeting. This brought tremendous applause, and was fully justified. The Rev. St. John Smith proposed thanks to the Council’s Yorkshire hosts, and Mr. Walter Ayre spoke appreciatively of the excellent organisation of the Monday Dales tour. The hon. secretary announced the attendance as 170 - the same as in 1969, made up as follows: 46 associations fully represented, 120; 11 partly represented, 27 (16 absent); six not represented (six absent); eight life members (two absent); 15 honorary members (seven absent). Total: 170 present; 31 absent. Summing up, the president said it had been a long but happy and very useful meeting, and thanked the officers for their services. He also thanked the members of the sub-committees for the work they had done for the Exercise in general and the Central Council in particular. He was very proud to be president of such a body and looked forward to continued support from the members. A. New methods and performances on Tower Bells. 11. 5024 Dereham S. Maj. Norwich D.A. 22. 5122 Xerxes S. Maj. Worcs & Dists. A. 25. 5088 Appledore S. Maj. Oxford D.G. 25. 5088 Osbournby S. Maj. Middlesex C.A. 31. 5088 Covingham S. Maj. Gloucester and Bristol D.A. 1. 5056 Festiniog S. Maj. Oxford D.G. 1. 5024 Jura S. Maj. Surrey A. 1. 5040 Wellesbourne S. Royal. Derby D.A. 15. 5040 Winchendon Bob Triples. Yorks. A. 20. 5152 Tendring S. Maj. Middlesex C.A. 21. 5152 Worthington S. Maj. Derby D.A. 22. 5152 Double Beeston Delight Maj. Southwell D.G. 1. 5042 Stancil S. Max. Leicester D.G. 8. 5184 Tattershall S. Maj. Kent C.A. 9. 5152 Pinxton S. Maj. Derby D.A. 15. 5056 Elmore S. Maj. Worcs and Dists. A. 15. 5120 Wellingborough S. Maj. Peterborough D.G. 15. 5040 New Gainsborough S. Royal. Southwell D.G. 19. 5056 Florence S. Maj. Worcs & Dists. A. 22. 5088 Wilby S. Maj. Hertford C.A. 22. 5234 Ealing S. Maximus. Leicester D.G. 9. 5040 Bastow Little Court Maj. Leicester D.G. 12. 5040 Gayton S. Royal. Peterborough D.G. 14. 5184 Treales S. Major. Surrey A. 17. 5152 Dalston S. Maj. Middlesex C.A. 19. 5056 Ingoldmells S. Maj. Surrey A. 19. 5056 Nene S. Maj. Peterborough D.G. 26. 5184 Dorcan S. Major. Gloucester and Bristol D.A. 26. 5120 Mattishall S. Maj. Greater London A. 26. 5280 Hollywood S. Maj. St. Martin’s Guild. 1. 5184 Real Double Glasgow S. Maj. Hertford C.A. 10. 5056 Omega S. Maj. Worcs and Dists. A. 13. 5056 Jonah S. Maj. Worcs and Dists. A. 14. 5088 Alexandria S. Maj. Surrey A. 15. 5152 Ullswater S. Maj. Oxford D.G. 24. 5184 Ypres S. Maj. Kent C.A. 31. 5088 Drighlington S. Maj. Yorkshire A. 31. 5024 Falcutt S. Maj. Peterborough D.G. 31. 5056 Xystus S. Maj. Greater London A. 4. 5088 Glevum S. Maj. Gloucester & Bristol D.A. 5. 5152 Taunton S. Maj. Middlesex C.A. 12. 5056 Wareham S. Maj. Salisbury D.G. 14. 5088 Medway S. Maj. Kent C.A. 21. 5184 Glamorgan S. Maj. Greater London A. 24. 5056 Mr. Rusty S. Maj. Worcs & Dists. A. 5. 5056 Bromyard S. Maj. Worcs & Dists. A. 10. 5040 Isleworth S. Royal. London C.A. 13. 5120 Hunger Hill S. Major. Lancashire A. 19. 5152 Clent S. Maj. Worcs and Dists. A. 19. 5040 Warfield S. Royal. Oxford D.G. 24. 5184 Spilsby S. Major. Middlesex C.A. 26. 5040 Slough Bob Royal. Middlesex C.A. 7. 5152 Little Bushey S. Maj. Hertford C.A. 12. 5120 Littleport Little Surprise Maximus. Soc. of Royal Cumberland Youths. 16. 5024 Xennapod S. Major. Peterborough D.G. 23. 5056 Byron S. Major. Middlesex C.A. 23. 5184 Lewisham S. Major. Soc. of Royal Cumberland Youths. 23. 5184 Bedwardine S. Major. Worcs and Dists. A. 27. 5056 Lathkill S. Major. Derby D.A. 4. 5152 Ixworth S. Major. Hertford C.A. 27. 5040 Thirston S. Royal. Peterborough D.G. 4. 5024 Quethiock S. Major. Peterborough D.G. 4. 5042 Evesham S. Maximus. Worcs & Dists. A. 8. 5152 Tuffley S. Major. Worcs & Dists. A. 11. 5040 Kedleston S. Royal. Derby D.A. 23. 5040 Ewerby S. Royal. London C.A. 25. 5184 Rushden S. Major. Peterborough D.G. 9. 5056 Aswarby S. Major. Surrey A. 15. 5184 East Coker S. Major. Bath & Wells D.A. 20. 5152 Chalfont S. Major. Middlesex C.A. 20. 5040 Wembley S. Maximus. St. Martin’s Guild. 22. 5152 Moorgate Delight Maj. Ancient Soc. of College Youths. 22. 5152 Higham Ferrers S. Major. Peterborough D.G. 22. 5024 Nempnett Thrubwell S. Major. Bath and Wells D.A. 27. 5136 Barford S. Maximus. St. Martin’s Guild. 17. 5056 Papanui S. Major. Midland C.G. 20. 5184 Alford Delight Major. Surrey A. 26. 5056 Pershore S. Major. Worcs & Dists. A. 27. 5088 Daisy Hill S. Major. Lancashire A. 29. 5088 Artaxerxes S. Major. Worcs & Dists. A. March 1. 5040 50-Spliced Surprise Maximus. Lancashire A.
June 21. 7168 32-Spliced Surprise Major (all the work). Winchester and Portsmouth D.G. May 25. 6728 Little Bob Major. Oxford Soc. July 5. 11,520 Eardisland Delight Major. Hertford C.A. B. New methods and performances on Hand-bells. Mar. 14. 5124 Wheathampstead Little College Bob Major. Hertford C.A. April 25. 5056 Kent T.B. Sixteen. Hertford C.A. Oct. 27. 5040 Little Bob Sixteen. Hertford C.A. Jan. 14. 5088 8-Spliced Surp. Major (all the work). Hertford C.A. Feb. 20. 5040 2-Spliced Surprise Maximus. Chester D.G. Feb. 24. 5120 32-Spliced S. Major. Hartford C.A. April 3. 5000 8-Spliced Pl. Royal. Hertford C.A. July 10. 5040 3-Spliced Surprise Maximus. Chester D.G. July 24. 5184 4-Spliced Surprise Maximus. Chester D.G. Aug. 21. 5040 8-Spliced Surp. Royal. Chester D.G. Sept. 4. 5088 6-Spliced Surprise Maximus. Chester D.G. Oct. 6. 5040 8-Spliced Surprise Maximus. Hertford C.A. Oct. 9. 5040 10-Spliced Surprise Maximus. Chester D.G. Oct. 30. 5040 12-Spliced Surprise Maximus. Chester D.G. The number of enquiries received by the Committee during 1969 shows a slight decrease on the previous year but nevertheless is the second highest yearly total on record. Advice on bell and tower restoration was given by members of the Committee in 1969 in one hundred and twenty-nine churches. Sixteen enquiries were dealt with by correspondence; the remainder necessitated visits to the churches concerned. As has been the custom for many years the report of the Committee’s work has been compiled by the Convenor from statistics sent in by its members, and a brief summary is appended. Bedfordshire (A.J.F. ), 3; Berkshire (F.S. ), 11; Buckinghamshire (F.S. ), 9; Cambridgeshire (B.D.T. ), 1; Carmarthenshire (F.S. ), 1; Cheshire (B.D.T. ), 1; Derbyshire (F.S. ), 1; Devon (J.G.M.S. ), 20; Dorset (F.E.C. ), 4; Essex (A.J.F. ), 1; Gloucestershire (F.S., B.D.T. ), 8; Glamorganshire (T.M.R. ), 4; Hampshire (F.E.C., F.S. ), 4; Herefordshire (F.S. ), 5; Hertfordshire (A.J.F. ), 1; Huntingdonshire (B.D.T. ), 1; Lancashire (A.J.F. ), 1; Leicestershire (F.S. ), 1; Lincolnshire (J.F. ), 3; London (A.J.F. ), 6; Monmouthshire (T.M.R. ), 1; Northamptonshire (B.A., A.J.F., F.S. ), 6; Oxfordshire (F.S. ), 1; Shropshire (F.S. ), 1; Somerset (H.J.S. ), 21; Sussex (F.E.C. ), 1; Warwickshire (F.S. ), 3; Wiltshire (F.E.C., F.S. ), 3; Worcestershire (F.S. ), 2; Yorkshire (F.S. ), 4. Total: 30 counties, 129 churches. In addition the Convenor met by appointment archdeacons in three separate dioceses to discuss bell restoration, and gave evidence on two occasions in Consistory Courts. He also accepted the invitation by the Dean of Gloucester to serve on the Conservation Committee of the Council for The Care of Churches. Advice given on: Maintenance of existing bell gear, 87 churches; Recasting cracked or unsatisfactory bells, 16; Augmentation of rings, 14; Repair of existing frames and gear, 24; Rehanging bells with near gear, 40; Installation of new bell frames, 23; Tuning, 27; Oscillation of towers and structural repairs to masonry, 53; Bell acoustics and sound control, 55; Sale of redundant bells, 2; Transfer of bells due to redundancy, 3; Replacement of stolen bell, 1; Welding, 1; Electronic “bells”, 1; Installation of ringers’ gallery, 1. Seventeen lectures have been given to Diocesan, Architectural and Professional organisations and Resident Ringing Courses. In addition members have when requested addressed Parochial Church Councils on many occasions. Considerable progress has been made on the production of the proposed two new handbooks and it is hoped to go to press with these this year. FREDERICK SHARPE (Convenor), F.S.A., F.F.B., F.I.O.B. J. G. M. Scott, M.A. As mentioned in the report for 1968 the convener was engaged early in this year in representations to the B.B.C. in an endeavour to effect a change in the bells used for introducing Sunday programmes on Radio 4, and these discussions raised hopes of not only changing the towers used but of increasing the number from four to eight. However, the powers that be decided eventually to do no more than add three towers to the four already being used, and the three chosen were St. Peter Mancroft ringing Stedman Caters, St. Philip’s Birmingham, ringing Cambridge Maximus and St. Mary and St. Helena, Elstow, ringing Bob Minor. The B.B.C. was not disposed to change the recordings of Evercreech bells being used for introducing Sunday programmes on Radio 2. From reports received it would appear that bells have been broadcast more frequently from local stations than in national programmes. In the MIDLANDS region Radio Leicester has broadcast recordings of several towers in the surrounding district to introduce its Sunday programmes. Radio Stoke, too, has used bells frequently and in one programme featured the bells of Newcastle-under-Lyme, and some of the ringers were interviewed. The newly-enthroned Bishop of Birmingham told the ringers there that he was greatly heartened to hear St. Martin’s bells broadcast on Christmas morning and regarded it as a welcome to his new diocese. In the WEST region the bells and ringers of Winchester College were featured on 27th April, in the B.B.C.’s “Meeting Point”. The programme, entitled “Compulsory Requirement”, dealt with religion in four schools in Winchester. In the section on Winchester College one of the subjects was bell ringing. There were shots of the ringers and a short touch of Plain Bob Minor was rung. Whilst the striking was not perfect it was creditable having in mind the fact that most of the ringers had been ringing for less than two years. No pre-service ringing has been noted this year, although there may well have been some instances not brought to our attention. Approaches have been made to the Regional Religious Organiser with a view to bells being more widely used prior to the broadcasting of services on T.V. A considerable amount can be done in this direction by the ringers on the spot keeping themselves well informed of local happenings and pressing for the bells to be included in a broadcast. From WALES again there is news of many broadcasts of bells during the year, most of them on I.T.V. Harlech. It interviewed Mr. Jack Hayward, an English millionaire living in the Bahamas who had given £150,000 for the purchase of Lundy Island and was appealing for the church there and its bells to be restored. The bells of St. Margaret’s, Westminster, were heard and shots of that church shown at the beginning of the I.T.V. film “80,000 Suspects”, and these bells were heard again in the background during an interview with Robert Maxwell, M.P. During the showing of the film “The Pool of London” the bells of St. Paul’s Cathedral could be heard for some time. During its news programme Harlech gave good coverage to the dispute over Stinchcombe bells, and in the same programme showed some good shots of the bells of Maisemore, Glos., being rehung in the tower after restoration. On Christmas Eve, Harlech’s programme for children, “Very, Very Varied”, was excellently produced and technically correct. There were demonstrations with a model bell and with the tower bells of Llandaff Cathedral. The ringers were interviewed in a very friendly fashion. Snowflakes were falling as the cameras approached the Cathedral, giving a touch of realism to the programme. The B.B.C. programme “Good Morning Wales” gave interviews with notable guests at the wedding of the Welsh rugby player, Barry John, and throughout the interviews could be heard the bells of St. Mary’s, Swansea. B.B.C. Heddiw gave shots of the ringers ringing the eight at Dolgelly, and a talk, in Welsh, with the ringers. The SCOTTISH region reports no broadcasting or televising of bells during the year. The choice of Inverness for the “Christmas Bells” programme appears to have been very convenient for the B.B.C., as it was already engaged on a programme connected with the centenary celebrations of the dedication of St. Andrew’s Scottish Episcopal Cathedral. In IRELAND too there seems to have been less broadcasting of bells than in previous years. The bells of St. Patrick’s Cathedral were heard over Radio Eireann ringing Grandsire Caters after the carol service on Christmas Eve. This appears to be an annual broadcast, Christ Church Cathedral bells were on the air on New Year’s Eve. Both cathedrals, of course, are in Dublin. The eight bells of Holywood represented Northern Ireland in the “Christmas Bells” programme. From the NORTH region we learn that the visit of the “Expo” belfry to Saltburn in July attracted the attention of B.B.C. television. The bells were seen in action on “Look North” with Durham and Newcastle ringers at the ropes. One of the band was interviewed. Radio Durham recorded bells around the county and broadcast them on a programme on Christmas Day as a prelude to the Bishop’s message for Christmas. The bells of Shincliffe, Roker, South Shields, Chester-le-Street, Lanchester, Stockton, Darlington (Holy Trinity) and Durham Cathedral were introduced by Nigel Holmes. Bells were heard preceding T.V. services on some occasions, and on Whit Sunday St. George’s, Doncaster, made their introduction with Spliced Surprise! In EAST ANGLIA the Visit of “Expo” to Long Melford was recorded for the B.B.C. Overseas Service and was heard by ringers in Singapore and Cyprus, and possibly elsewhere - very interesting news, The “Expo” was also shown on Anglia T.V. Other items of broadcasting news (very brief) as supplied by B.B.C. Norwich, are - on radio - mention of a peal at Warboys to mark a ringer’s 81st anniversary, an appeal for the bells of St. Mary-le-Tower, Ipswich, tolling (?) for Biafra, and the bells of Wherestead being taken into safe custody (shown also on T.V.). LONDON region. The news of any broadcasting of bells in this region is very scarce. During spring and summer Radio 2 on Saturday mornings issued rounds on eight to precede greetings to couples being married on that day. At the end of the year came the programme “Magpie”, when the Whitechapel “Expo” belfry was erected in the T.V. studio and the bells rung by a band drawn from The Ancient Society of College Youths. This was described very graphically by W. T. Cook in “The Ringing World” in January. The B.B.C. again invited the convener to attend the editing and building-up of the master tape for the “Christmas Bells” programme. This is made much simpler and occupies much less time now that the ringers indicate which section of their tape they consider to be best for the broadcast. H. N. PITSTOW (Convener), “Saffron”, High Street, Banstead, Surrey. D. A. Bayles, J. T. Dunwoody, G. E. Fearn, J. S. King (Mrs.), H. J. Sanger, A. G. Thurlow, R. S. Wilson. The following will bring up to date the Central Council Collection of Surprise methods as far as the end of 1969. 13F. Hunger Hill (f) -38-14-1256-1238-14-38-1256-3. 22F. Higham Ferrers (b) -38-14-1258-36-14-38.14.36.14.7. 26F. Daisy Hill (f) -38-14-56-36-34-1258-14-5. 37F. Little Bushey (e) -38-14-58-36.14-14.38.16-16.5. 38F. Mr. Rusty (b) -38-14-58.12.36-12-38-16.34.7. 50F. Nempnett Thrubwell (mx) -58-14.58-58.16-14-1258-14-1. 70F. New Gainsborough (b) -30-14-50-16-1470-58-1236-70-18-9. Alexandria 14- 5-69 Putney 3F. Appledore 25- 1-69 Deddington 69C. Artaxerxes 29-12-69 Norton, Worcs 30F. Barnwood Rung in Spliced 45F. Bedwardine 23- 8-69 Bedwardine 8F. Bisley Rung in Spliced 48F. Bromyard 5- 7-69 Bromyard 20F. Buckland Rung in Spliced 12F. Byron 23- 8-69 Harrow-on-the-Hill 62F. Caversham Rung in Spliced 57F. Chalfont 20-11-69 Harrow Weald 49F. Clent 19- 7-69 Clent 53F. Covingham 31- 1-69 Stratton St. Margaret 27F. Daisy Hill 27-12-69 Farnworth-with-Kearsley 26F. Dalston 17- 4-69 Willesden 65F. Dereham 11- 1-69 Stamford Hill 10F. Dorcan 26- 4-69 Stratton St. Margaret 51F. Drighlington 31- 5-69 Drighlington 61F. Elmore 15- 3-69 Longney 14F. Fairford Rung in Spliced 5F. Falcutt 31- 5-69 Oakham 11F. Festiniog 1- 2-69 Adderbury 55F. Florence 19- 3-69 Norton, Worcs 35F. Glamorgan 21- 6-69 Barnes 42F. Glevum 4- 6-69 Stratton St. Margaret 39F. Harwell Rung in Spliced 46F. Higham Ferrers 22-11-69 Higham Ferrers 22F. Hollywood 26- 4-69 Packwood 60F. Hunger Hill 13- 7-69 Helmshore 13F. Ingoldmells 19- 4-69 Barnes 24F. Ixworth 4- 9-69 Bushey 36F. Jonah 13- 5-69 Longney 16F. Jura 1- 2-69 Esher 41F. Lathkill 27- 8-69 Darley Dale 15F. Lewisham 23- 8-69 Lewisham 58F. Little Bushey 7- 8-69 Bushey 37F. Mattishall 26- 4-69 Stamford Hill 4F. Medway 14- 6-69 Edenbridge 54F. Mr. Rusty 24- 6-69 Norton, Worcs 38F. Nempnett Thrubwell 22-11-69 Ditcheat 50F. Nene 19- 4-69 Rothwell 59F. Omega 10- 5-69 Colwall 31F. Osbournby 25- 1-69 Pinner 2F. Papanui 17-12-69 Cole Orton 17F. Pinxton 9- 3-69 Pinxton 34F. Quethiock 4-10-69 Easton Neston 47F. Sonning Rung in Spliced 63F. Spilsby 24- 7-69 Willesden 28F. Tattershall 8- 3-69 Woolwich 43F. Taunton 5- 6-69 Willesden 1F. Tendring 20- 2-69 Willesden 64F. Thatcham Rung in Spliced 33F. Treales 14- 4-69 Putney 52F. Ullswater 15- 5-69 Islip 56F. Wareham 12- 6-69 Wareham 19F. Wellingborough 15- 3-69 Wellingborough 21F. Wilby 22- 3-69 Wilby 40F. Worthington 21- 2-69 Leicester, All Saints 23F. Xennapod 16- 8-69 Moulton 32F. Xerxes 22- 1-69 Norton, Worcs 29F. Xystus 31- 5-69 Woolwich 25F. Ypres 24- 5-69 Sittingbourne 44F. Bollington Rung in Spliced 73F. Gayton 12- 4-69 Northampton, St. Giles 66F. Isleworth 10- 7-69 Isleworth 71F. Kedleston 11-10-69 Derby, All Saints 68F. New Gainsborough 15- 3-69 Retford 70F. Thirston 27- 9-69 Daventry 67F. Warfield 19- 7-69 Warfield 74F. Wellesbourne 1- 2-69 Stratford-on-Avon 72F. Barford 27-11-69 Birmingham Cathedral 85F. Clifton Rung in Spliced 79F. Ealing 22- 3-69 Leicester, St. Margaret 80F. Fulham Rung in Spliced 86F. Hurdsfield Rung in Spliced 78F. Indiana Rung in Spliced 75F. Leatherhead Rung in Spliced 81F. Littleport Little 12- 8-69 Shoreditch 88F. Mellor Rung in Spliced 84F. Pennine Rung in Spliced 87F. Reading Rung in Spliced 83F. Stancil 1- 3-69 Leicester Cathedral 77F. Utah Rung in Spliced 76F. Wembley 20-11-69 Birmingham Cathedral 47D. Appendix A - July 2, 1965, page 449; Appendix B - June 17, 1966, page 390 and July 15, 1966, page 461; Appendix C - June 30, 1967, pages 462 and 463; Appendix D - June 12, 1968, page 555; Appendix E - July 4, 1969, page 523 and July 25, page 594.